I'm always on the look out for God-aware picture books to enrich my boys' understanding of Him. 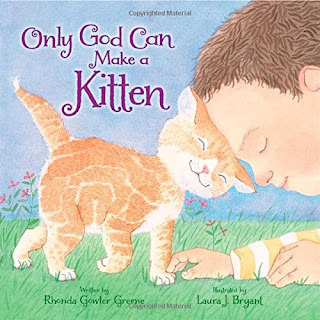 Only God Can Make a Kitten, by Rhonda Gowler Greene and illustrated by Laura J. Bryant looked promising for several reasons. The book follows a curious boy, his mom and baby sister as they romp through quintessential experiences of a curious kid outdoors- star gazing, tree climbing, beach splashing, nest spying and kitten snuggling to name a few. With each new scene, the boy asks, "Mama, who made...?" Mama answers her little boy in simple rhyme that God made each wonder he points out. "Mama, look! On the ground! Who makes these rocks so smooth and round?" the boy exclaims as he scales a pile of boulders. "With a way unknown, only God can make a stone," Mama answers as she climbs after her son. Clearly, the emphasis is on maintaining the rhyme and allowing for mystery, not presenting awe-inspiring facts about nature (which my curious, outdoors-loving boys would have preferred). However, I liked that the entire book follows the young family as they appreciate the wonders of creation. For parents, this book is a good reminder of the treasure that is spending time outdoors, allowing our children to take the lead. My three boys enjoy doing all the things that the characters in this book do, and my oldest is always asking questions, so I thought this might be of interest to them. The age range, according to publisher Zonderkids, is 4-8, and my two oldest fit into this bracket. However, the book did not really hold their interest because, my 6-year-old says, "I like books that tell a story; this one didn't really have a story." Though he didn't mention it, I think the soft pastel watercolor illustrations might also explain why my boys weren't drawn in the way I'd hoped; they tend to like bolder colors. 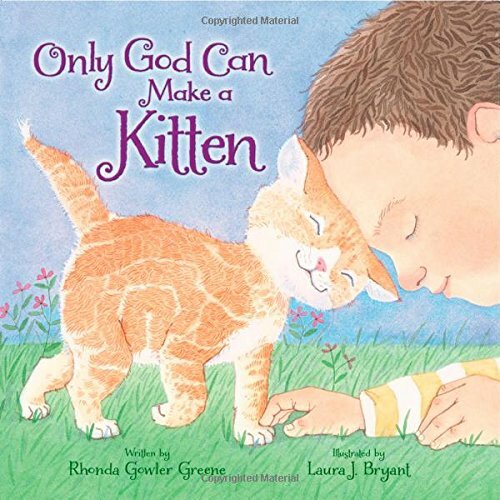 Only God Can Make a Kitten would make a sweet bedtime story for the 2- to 3-year-old set, who might not fully grasp the vocabulary, but would enjoy the soft artwork and lulling sound of the rhymes. Curious and thoughtful outdoor adventurers in the recommended 4- to 8-year-old range might opt to skip the book and head outside instead.